When I was invited to be nominated as the 115th president of the Society of Biblical Literature2 I of course felt very honored, and was not reluctant to accept, but I also felt a bit uncomfortable or unsure about the appropriateness of the choice. Normally the presidentship of SBL alternates between "OT" and "NT" scholars, and my immediate predecessor (Lyn Osiek) clearly qualified for the latter category. Although I have done some work on Greek Jewish scriptures ("LXX/OG"),3 I can hardly be considered an "OT" person; indeed, I do not think of myself at all as a "bible scholar" in a traditional sense, even though my career has included investigations of traditionally biblical subjects such as [[image #3 (MA thesis title page)]] an MA thesis on the use of Jewish scriptures in the canonical Jesus traditions4 and occasional excursions into specific NT exegetical problems -- was the "Theophile" (in the vocative) to whom Luke-Acts is addressed a woman?5 [[image #4 (excursions titles)]] Did the tradition reflected in the NT book of Acts about Paul being called "Saul" (from the tribe of Benjamin) originate with some of his opponents who identified him in an uncomplimentary manner with the Benjaminite king Saul of ancient Israel notariety? Was Paul's identification with "Tarsus" due to a misunderstanding on the part of the author of Acts (or its sources) of Paul's occupational affiliation with the "Tarsian" guild of weavers in Judea?6 But those were unpublished exceptions, and along with some dabbling in Dead Sea Scroll studies7 and the aforementioned textcritical interests in [[image #5 (IOSCS Bulletin)]] that heterogeneous anthology of old Greek translations that unfortunately has come to be known simplistically as "the Septuagint," pretty much summed up my qualifications to be considered as a "bible scholar," strictly speaking. 2 Depending on how one counts: president Francis Brown served two non-consecutive terms (1889-90, 1895-96), and I'm counting as single terms the consecutive terms of Goodwin (1880-87; see further below), Frederick Gardiner (1887-89), Talbot Wilson Chambers (1891-94), George Foote Moore (1898-99), and Kirsopp Lake (1942-43); thus 113 persons have served 114 presidential terms (covering 125 years) before this. 4 Contributions of Jesus to a Modern Discussion of Inspiration. Unpublished MA Thesis, Wheaton (IL) College Graduate School, 1957. 5"To Her Excellency, Theophile (Luke 1.3, Acts 1.1)," read "by title" (i.e. there was no room for it on the program) at the SBL Middle Atlantic Section Annual Meeting, 26 April 1964. 6 "PAULOS TARSEA (Παῦλος Ταρσέα): Misunderstood Traditions about Paul in the Book of Acts" (unpublished). 7 Collaborated with Emanuel Tov and wrote the section on "Description of the Materials" (pp. 14-19) in production of The Greek Minor Prophets Scroll from Nahal Hever (8HevXIIgr) (Oxford: Clarendon, 1990); "Pliny on Essenes, Pliny on Jews," Dead Sea Discoveries 8 (2001) [in honor of Emanuel Tov] 255-261. 8 Information about the history of the Society has been garnered especially from Ernest W. Saunders, Searching the Scriptures: A History of the Society of Biblical Literature, 1880-1980 (Chico CA: Scholars Press 1982). See also the reviews (available on JSTOR) by Martin Marty (JBL 103  85-88) and William R. Farmer (Church History 53  564-565), as well as the severe critique of the SBL by Hector Avalos, "The Ideology of the Society of Biblical Literature and the Demise of an Academic Profession," on the 2006 SBL Forum site (http://www.sbl-site.org/Article.aspx?ArticleId=520). 9 The University of Pennsylvania Archives provide a brief biography with a picture (http://www.archives.upenn.edu/histy/people/1800s/goodwin_daniel_r.html). A lengthy obituary (with bibliography) by J. Vaughan Merrick can be found in the Proceedings of the American Philological Society 38.134 (1890) 227-241 (now available online through JSTOR). 10 Address before the alumni of Bowdoin college, July 8, 1873 Brunswick ME: Joseph Griffin 1873) 23 and 29-30; online (27se06) at http://www.hti.umich.edu/cgi/t/text/text-idx?c=moa;idno=AGF7949.0001.001 . The issue of the relationship between "science," "religion," and "classical learning" became a recurring motif in SBL presidential addresses [[image #11 (Presidential Addresses)]] and discussions.11 While I do not intend to revisit that theme directly here, it should become obvious that for me, learning responsibly about the ancient contexts from which derives what came to be "Bible" with associated religious interests is, well, paramount. 11 E.g. Julian Morgenstern's programmatic presidential address in 1941 ("The Society of Biblical Literature and Exegesis," JBL 61  1-10), when he saw the need for broadening the perspectives of "biblical science." See also, among others, Frank Chamberlain Porter, "The Bearing of Historical Studies on the Religious Use of the Bible," HTR 2 (1909) 253-276; James A. Montgomery, "Present Tasks of American Biblical Scholarship," JBL 38 (1919) 1-14; Henry J. Cadbury, "Motives of Biblical Scholarship," JBL 56 (1937) 1-16; Morton Scott Enslin, "The Future of Biblical Studies," JBL 65 (1946) 1-12. 12 E.g., among others, David G. Lyon , “On the Archaeological Exploration of Palestine,” JBL 30 (1911) 1-17; Albert T. Clay , “A Recent Journey through Babylonia and Assyria” [unpublished in JBL]; William Frederic Badè , “Ceramics and History in Palestine,” JBL 50 (1931) 1-19; Elihu Grant , “The Philistines,” JBL 55 (1936) 175-194, not to mention the very versatile William Foxwell Albright , "The Ancient Near East and the Religion of Israel,” JBL 59 (1940) 85-112. 13 E.g. George Foote Moore [1898-99], "Jewish Historical Literature" (mentioned in the minutes from 1898, JBL 18  iii) and "The Age of the Jewish Canon of Hagiographa" (mentioned in the minutes from 1899, JBL 19  i); Richard J. H. Gottheil , "Some Early Jewish Bible Criticism,” JBL 22 (1904): 1-12; Robert M. Grant , “Two Gnostic Gospels," JBL 79 (1960) 1-11, among others. 14 According to Saunders (13), "the twenty-eighth meeting in 1894, held at the University of Pennsylvania, was the initial attempt of the Society to hold its meetings jointly with other societies dedicated to the humanities. ... Billed as a 'Congress of American Philologists,' the program provided for some common sessions involving the American Oriental Society, American Philological Association, Modern Language Association, American Dialect Society, Spelling Reform Association(! ), and the Archaeological Institute of America. ... In 1900 the University of Pennsylvania again convened a 'Congress of Philological and Archaeological Societies' made up of the same seven associations ... and in 1918, joint meetings were held with the Archaeological Institute of America and several other associations." SBL was active in the founding of the ASOR in the late 1890s (Saunders 16), and the two groups have frequently met jointly, as they still do. The American Academy of Religion had its roots within SBL, beginning in 1909 as a "conference of biblical instructors" (later the "National Association of Biblical Instructors" which became the AAR in 1963). Except for 1966-1969, SBL and AAR have held joint annual meetings to the present (see Saunders 24), although this practice will be interrupted again in 2008 with the next joint meeting planned for 2011. 15 For evidence, one need only look at the lists of "groups," "seminars," and "consultations" in the program book for this 2006 meeting (pp. 228-229). 16 Online OED ("draft revision June 2005"), "para-, prefix1" -- the 1989 2nd edition has: "‘by the side of, beside’, whence ‘alongside of, by, past, beyond’, etc." 17 Google.com shows several hits for "parascholarly" and for "parascholar," with various senses. Intriguing is the undeveloped entry in the OED for the prefix para as "Forming words with the sense ‘protection from [something or other].'" Maybe that can also apply to some of the uses I'm exploring here! 18 Since 1962, the term "paradigm shift" (a radical, if often gradually developed, "revolution" in scientific theory to replace a basic viewpoint that has proved to be inadequate) has received a great deal of attention as a result of Thomas S. Kuhn's book, The Structure of Scientific Revolutions (University of Chicago Press, 1962, 19702, 19963). For a detailed discussion, critical of the wide appropriation of the term in other fields , see http://en.wikipedia.org/wiki/Paradigm_shift [as of 6 Jan 2007]; on various senses of "paradigm," http://en.wikipedia.org/wiki/Paradigm [same date], citing among others Margaret Masterman, "The Nature of a Paradigm," pp. 59-89 in Imre Lakatos and Alan Musgrave. Criticism and the Growth of Knowledge (Cambridge Univ. Press, 1970). and so it goes with most of the general terms and concepts we employ -- all those ambiguities and loose ends, those things that don't quite fit, constitute this often paradoxical universe of "para." 2. Pathways to understanding, and the problem of textual myopia. 19 The classic treatment of the history of the codex is the 1954 article ("The Codex") by Colin H. Roberts, revised and updated by Theodore C. Skeat, The Birth of the Codex (Oxford University Press for the British Academy 1983, republished 1987). 20 Letter of Constantine, reproduced by Eusebius in his Life of Constantine 4.36, usually dated between 330-335; see T. C. Skeat, "The Codex Sinaiticus, the Codex Vaticanus and Constantine," JTS 50 (1999) 583-625 (reprinted in J.K.Elliott, ed., The Collected Biblical Writings of T. C. Skeat [Brill 2004] 193-237), 193-237). Skeat thinks the letter refers to the entire canonical scriptures as defined in Athanasius' Easter/Paschal Letter of 367, although he notes that some scholars disagree (216, n. 28). See also Gregory A. Robbins, "Fifty Copies of the Sacred Writings [Vita Constantini 4.36]: Entire Bibles or Gospel Books?" Studia Patristica 19 (1989) 91-98. 21 On female involvement in copying manuscripts, see, among others, Kim Haines-Eitzen, Guardians of Letters: Literacy, Power, and the Transmitters of Early Christian Literature (Oxford University Press, 2000). On details of such book production, see Christopher Calderhead, Illuminating the Word : The Making of the Saint John's Bible (Collegevile: Liturgical Press, 2005). Skeat provides detailed estimates on the weight, etc., of the codices to be sent by Eusebius to Constantine (ibid., e.g. 217f,). 22 Vaticanus consists of 1536 vellum pages; Sinaiticus is more fragmentary, with about 400 vellum pages known in 1914 (and several more now); and Alexandrinus is now bound in two volumes, containing 778 vellum pages. Skeat supposes that book boxes were prepared for Eusebius' shipment, in each of which a complete copy could be enclosed safely (ibid., 220). This move to the physical unification of Christian "scriptures" in the mega-codex format ultimately did produce complete bibles (called "pandects"),23 [[image #27 (pandects)]] sometimes still in multiple volumes, and a "paradigm shift" (see above, n. 18) in how one might think about "the Bible." Most if not all of us have been weaned on that paradigm, and we sometimes speak unthinkingly of such things as "Philo's bible," or "the bible of Jesus and the early Christians," or "the Hebrew bible" and "the Septuagint. "24 But prior to Constantine's time, we lack evidence for such physically unified collections, and certainly there is no evidence of single codices containing every writing that 4th century churchmen such as Eusebius or Athanasius considered authoritative. 24 These and similar phrases abound in the literature and on the internet, as will be evident from a few probes with your favorite search program. My own current preference is to refer to (1) "Jewish scriptures" (they aren't entirely in "Hebrew" after all), emphasizing the plurality (scriptures) as well as the transmitters (Jewish), to (2) "LXX/OG," calling attention to the heterogeneity of the gradually growing collection(s) of Greek Jewish scriptures, and to (3) "Jesus traditions" (in various versions, canonical or not), "early Christian literature," and the like. For individual writings or groups that became canonical later on, terms such as "proto-canonical" or even "pre-canonical" might be useful, with careful definition. Also "scriptures" and "scriptural" have their shortcomings in historical contexts where perhaps simply undifferentiated "books" are in view..
26 An image of a relatively large capsa (holding about 12 scrolls) was found in the Domitilla catacomb in Rome, dated to the 4th century CE. It also shows a flying codex above the capsa, for whatever reason; see http://ccat.sas.upenn.edu/rs/rak/publics/new2/sbl2006-pics/Slide31.JPG. 27 The online TLG data bank lists over 2500 occurrences of the use of "holy" and "scriptures" within one line of each other, over 93% of them from the 4th century or later (from which, of course, most of the surviving Christian texts come). Clement of Alexandria and Origen show a significant increase of usage compared to earlier witnesses. 28 Reference to "the books" is often found in ancient texts (about 65 times in texts earlier than Aristeas and the Old Greek translations), and is used specifically of special Jewish books (i.e. scrolls) in Aristeas 9.3 (contrast 322.2), 4 Kingdoms [2 Kings] 19.14, and especially 1 Macc (1.56 "of law," 12.9 "holy") and 2 Macc 2.13 ("of kings ... prophets ... David"). Josephus uses it of Jewish texts several times. The famous Pauline passage in 2 Tim 4.13 is ambiguous ("the books, especially the parchments"). When "the books" first came to be used to designate the collection of canonical scriptures is unclear to me, but the online OED (under "Bible") suggests that Origen may have done so in the early 3rd century (in Joannem 5.4 [but see n. 29, below]). "In Latin, the first appearance of biblia is not ascertained. Jerome uses bibliotheca for the Scriptures, and this name continued in literary use for several centuries." OED gives no Latin example before the 9th century. Origen of Alexandria and Caesarea, in the early 3rd century, is rightly credited with emphasizing [[image #32 (Origen-one book)]] that the plural scriptures are to be viewed as a single book. He notes that "the preacher" warns against "the making of many books" (Qohelet 12.12) and he even tries to beg off from multiplying his own already extensive writings.29 But with regard to "the divinely inspired scripture(s)," Origen recognizes plurality and does not speak of some sort of spacial physicality, but of their unity of focus, in the context of his Platonic concept of the ideal Word and his somewhat fuzzy edged canon usage (lacking, e.g., 2 Peter, 2-3 John).30 [[image #33 (Origen's canon)]] Although he was quite active in attempting to overcome some of the fragmentation present in his world of scrolls and mini-codices -- witness his gigantic Hexapla project, to overcome the diversity of readings in the Greek Jewish scriptures as he knew them -- he was not yet possessed of the one-book technology that would permit him actually to produce a copy of the unified scripture(s) under one set of covers. Origen's unified bible book was an ideal, to be realized concretely through lists -- [[image #34 (Amiatinus canon list)]] such as this much later one in the codex Amiatinus31 -- and through collections of scrolls and mini-codices. 29 Origen, in his Commentary on John at 5.4-6, cites Qohelet 12.12 ("my son, avoid making many books") and states that "all the sacred (scriptures) are one book, but 'many (books)' are the ones that are outside of those." For Origen, Christ is the one Word, written about in all the scriptures, quoting Ps 39.8 -- "In the chapter of the book it is written concerning me." Origen's demurral about writing is a special case, since he argues that false accusations from Celsus don't require or deserve a response -- after all, Jesus was silent before his accusers (Contra Celsum, prologue). 30 Origen's canon, as reported by his admirer Eusebius (HE 6.25, citing Origen's lost Selections from Psalms), includes "22 Hebrew books" (and he gives their Hebrew names). Apparently Origen found the following works in one scroll or mini-codex: Judges and Ruth, 1 and 2 Kingdoms (= 1-2 Samuel), 3 and 4 Kingdoms (= 1-2 Kings), 1-2 Paraleipomena [Chronicles], 1 and 2 Esdras, Jeremiah and Lamentations and the Epistle of Jeremiah. He also mentions "the Maccabees" as "outside" books. Origin also knows and uses materials found in our "NT," but no similar comprehensive list from him has survived. 31 The Latin codex Amiatinus, from the early 8th century, gives lists of scriptural books (scriptura omnia) grouped under "OT" (vetus) and "NT" (novum) (see also n. 23, above). Prior to the development of the mega-codices of the 4th century and beyond, it is unusual to find more than one or two books of the size of Genesis or Matthew together under one set of codex covers.32 [[image #35 (list of mini-codices)]] It is possible that at least the Pauline epistles, or even all four canonical gospels were brought together in early second century codices, and certainly by the end of the 2nd century, but even then, it is a far cry from having an entire NT, much less an entire bible as we have come to know it.33 The same can be said about the five books of Moses, although the possibility of having them all in a single codex prior to the 4th century is probably even more remote.34 [[image #36 (Ravenna gospel shelves)]] Such small collections, of course, could easily be kept together in a special container or location. Portability would be very limited. 32 Early mini-codices containing multiple texts include P.Baden 56 (Ex and Deut, papyrus = 907, late 2nd CE), P.Chester Beatty 6 (Num and Deut, papyrus = 963, ca 200 CE), P.Chester Beatty 2 (Pauline corpus = p46, ca 200 CE), P.Chester Beatty 9 (Ezek and Daniel and Esther = 967, papyrus 3rd CE), P.Antinoopolis 8 (Prov and Wisdom of Solomon and Sirach = 928, papyrus 3rd CE), P.Michigan 6652 (Matt and Acts = p53, 3rd CE), P.Bodmer 14-15 (Luke and John = p75, 3rd CE), P.Chester Beatty 1 (Gospels = p45, 3rd CE), P.Washington Freer (Minor Prophets, papyrus = W, late 3rd CE), P.Bodmer 46 (Thucydides and Daniel and Susannah, papyrus = ? ?, 3rd/4th CE), P.Bodmer 7-8 (1-2 Peter and Jude = p72, 3rd/4th CE). Skeat argues that "The Oldest Manuscript of the Four Gospels" (NTStudies 43 , 1-34; reprinted in Elliott, Writings [above n. 20], 158-192) is represented by p4 (Luke) + p64 (Matthew) + p67 (Matthew), from which he reconstructs a single-quire codex dating to the last decades of the 2nd century, while recognizing divergent scholarly judgments. 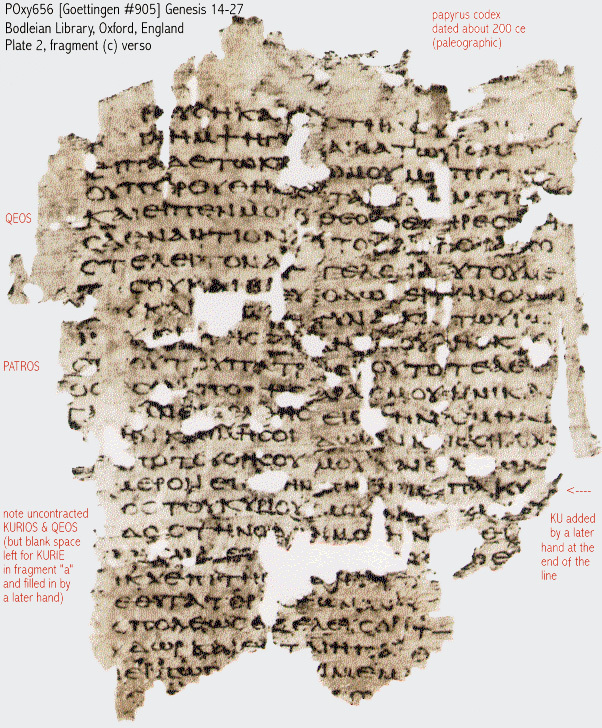 33 Skeat has suggested that early Christians may have developed the codex to authorize the four canonical gospels to the exclusion of other competing gospels ("The Origin of the Christian Codex," Zeitschrift für Papyrologie und Epigraphik 102 (1994) 263-268; reprinted in Elliott, Writings [avove n. 20], 79-87); David Trobisch argues that the thirteen Pauline epistles were collected into an early codex -- The First Edition of the New Testament (New York: Oxford University Press, 2000); see his online “The Oldest Extant Editions of the Letters of Paul” (Internet: http://www.religion-online.org/showarticle.asp?title=91: 1999). 34 All of the pre-4th century codices are fragmentary, and thus it cannot be determined unambiguously whether we might sometimes have pieces of the same codex written in different scribal hands. But barring such problems, the evidence for possible early Jewish codices is collected in my online discussions of "Early Jewish and Early Christian Copies of Greek Jewish Scriptures" (http://ccat.sas.upenn.edu/rs/rak/earlylxx/jewishpap.html). Working our way back, we come to the world of scrolls -- [[image #37 (scroll)]] a world that continues well beyond the time of Origen, especially outside of Christian (and perhaps Greek Jewish) circles. A single scroll might be expected to hold a work of the length of Genesis or Matthew, and although theoretically a scroll could be enlarged almost ad infinitum, in actuality the limits seem to be fairly firm.35 Understandably, the earliest codices, from the end of the first century CE onward, tended to replicate the contents of the existing scrolls -- thus the appearance of "mini-codices" in the second century and at the time of Origen. 35 For an attempt to determine the length of a standard papyrus roll, see T. C. Skeat, "The Length of the standard papyrus roll and the Cost-advantage of the Codex," Zeitschrift für Papyrologie und Epigraphik 45 (1982) 169-175 (reprinted in Elliott, Writings [avove n. 20], 65-70). 36 See note 32 above, and E. G. Turner, Typology of the Early Codex (University of Pennsylvania Press, 1977). [[image #38 (scroll/codex distribution)]] The technological transfer from scroll to codex was more gradual in the general Greek-Roman world than in Christian circles -- and probably slower yet in classical Semitic Jewish contexts,37 although what was happening among Greek speaking Jews at the same time remains mostly a mystery.38 In case you hadn't noticed, we are dealing already with "para-history" -- the often unnoticed contexts in which the main lines of reconstructed history take place. 37The evidence for transitions from scroll to codex in the "pagan" and "Christian" worlds has been presented by Roberts and Skeat, Birth, 35-44 -- almost all remains of "Christian" writings from the 2nd century onward are in codex form, while "pagan" literature from the 2nd century shows less than 10% on codices. By the early 4th century, the ratio of scroll to codex in "pagan" liturature has begun to tip in favor of codices. 38 On possible early Jewish Greek codices see also above, n. 34. The old "rule of thumb" that if something is in codex form, it must be Christian, requires reevaluation. The strongest candidates for early Jewish codices, using such factors as the representation of the tetragrammaton as evidence, include: POxy656 of Gen 14-27 (2nd/3rd ce), POxy1007 of Gen 2-3 (3rd ce) -- see http://ccat.sas.upenn.edu/rs/rak/earlylxx/jewishpap.html#earlymss and http://ccat.sas.upenn.edu/rs/rak/lxxjewpap/tetragram.jpg The Greek fragments of Aquila in a 5th-6th c Cairo Geniza palimpsest codex also deserves mention (http://ccat.sas.upenn.edu/rs/rak/publics/new2/sbl2006-pics/Slide45.JPG). See further Nicholas de Lange, Greek Jewish Texts from the Cairo Genizah (Mohr/Siebeck, 1996). See below, at n. 46, on evidence from palimpsests and reused scrolls. 40 See Anthony Grafton and Megan Williams, Christianity and the Transformation of the Book: Origen, Eusebius, and the Library of Caesarea (Harvard University Press, 2006). 41 The date and provenance of the "Muratorian canon" has been much discussed and debated. If it did, indeed, originate in the late 2nd century, it would predate Origen and be roughly contemporaneous with Melito (see next note). See Geoffrey Mark Hahneman, The Muratorian Fragment and the Development of the Canon (Oxford: Clarendon, 1992), Albert C. Sundberg Jr., "Canon Muratori: A Fourth Century List," Harvard Theological Review 66 (1973): 1-41. 42 Melito's letter to Onesimos, reported in Eusebius, HE 26.12-14: "Since you have often requested to have extracts from the law and the prophets concerning the savior and our entire faith, and to learn accurately about the ancient books, as to their number and their order, I have hastened to do this.... Thus when I went east and came to the place where these things were proclaimed and done, and learned accurately the books of the old covenant, I sent this information to you. [The list follows here.] From which I also have made the extracts, dividing them into six books." Presumably Melito was not sufficiently informed and/or confident about information available in the Sardis area, and thus checked things more precisely during his trip to the "east." 43 Literature on Marcion is extensive. Still foundational is Adolf von Harnack, Marcion: Das Evangelium vom Fremden Gott (German original Hinrichs, 1921, 19242; partial English translation by John E. Steely and Lyle D. Bierma; Marcion: The Gospel of the Alien God [Labyrinth, 1990]); see also John Knox, Marcion and the New Testament (University of Chicago Press, 1942), E. C. Blackman, Marcion and his Influence (SPCK, 1948), R. Joseph Hoffmann, Marcion: on the Restitution of Christianity (Scholars Press, 1984), and Trobisch (above, n. 33). 44 For a recent convenient survey of the situation, see David Sider, The Library of the Villa dei Papiri at Herculaneum (Los Angeles: The J. Paul Getty Museum, 2005). Other evidence is discussed in some detail by R. Otranto, Antiche liste di libri su papiro (Rome 2000); see also Harry Y. Gamble. Books and Readers in the Early Church: A History of Early Christian Texts (Yale University Press, 1995). Research on ancient libraries is currently being conducted by George W. Houston (University of North Carolina at Chapel Hill) -- see, e.g. "The Smaller Libraries of Roman Egypt" (online precis from March 2005 at http://www.camws.org/meeting/2005/abstracts2005/houston.html). See now also Lionel Cassen, Libraries in the Ancient World (Yale University Press, 2001). 45 On booksellers and bookselling, see Eduard Stemplinger,Buchhandel im Altertum (Tusculum-Schriften 9; Munich, 1933), and Tönnes Kleberg, Bokhandel och bokförlag i antiken (German translation by Ernst Zunker, Buchhandel und Verlagswesen in der Anitke; Darmstadt: Wissenschaftliche Buchgesellschaft, 1967). 46 If the Aquila text (with the tetragrammaton in paleo-Hebrew letters) originated in a Greek Jewish context, it would be one of the earliest known examples of a Jewish biblical codex (see above, n. 38). We are told in Justinian's edict (6th century) that Aquila was to be used in Jewish synagogues, but the presence of many Christian Greek texts (including fragments of Augustine) among the Cairo Geniza palimpsests complicates the picture. If the Exodus text of the POxy 1075 scroll is Jewish in origin, it attests the use of the shortened Greek tetragrammaton equivalent (ΚΥΡΙΟΥ to ΚΥ overlined) in Greek Jewish circles. For other examples of similar "reuse," see the online Duke list (http://scriptorium.lib.duke.edu/papyrus/texts/material-aspects.html). A detailed study of such phenomena would be useful. So how do we conceptualize "the bible" in such circumstances? Physically, even if one has some sort of list, there is lots of room for loose edges, unless the list is quite restrictive (such, perhaps, as Marcion's seems to have been). General categories such as "law" (or perhaps "Moses"), prophets, histories, psalms, gospels, acts, letters, apocalypses, receive mention.47 [[image #47 (Josephus passage)]] Exactly what is contained in each is not always clear. It is unlikely that many people were in a position actually to see much of this material. Philo in Alexandria, and after him Clement and Origen, are probably exceptions; and Ben Sira's grandson the translator, also in Alexandria.48 Josephus in his privileged context in Jerusalem is likewise unusual in this regard.49 But in general, then as now, most people must have depended on secondary transmissions for what they thought they knew -- public or private word of mouth, whether associated with an institution such as a school, synagogue or an underground church, or within social and family contexts. Those who could read and who had time and opportunity to do so might have seen some full texts, but also excerpts of various sorts (e.g. summaries of laws, or quotable sayings, or prophetic "testimonia" [[image #48 ("Testimony" books)]]).50 All of these constituted "scriptures" in some sense, and could be referred to as such, usually without much specificity or detail. 47 Josephus refers to "Moses" and "the prophets after Moses," along with four other books (Against Apion 1.38-41). For him, "prophetic succession" seems a crucial criterion. The translator of the Wisdom of Jesus Ben Sira thrice refers to "law, prophets" and the rest of the writings that followed (Prologue). In Luke 24.44 we find "law of Moses, prophets, and the psalms." For other listings, see Lee Martin McDonald, "Primary Sources for the Study of the Old Testament/Hebrew Bible Canon," and "Primary Sources for the Study of the New Testament Canon," Appendices A-B (580-584) in The Canon Debate (below, n. 61; also online at http://www.bible.ca/b-canon-resource-list-macdonald.htm) The Pinakes of Callimachus (mid 3rd century BCE), of which fragments survive, includes the following categories of literature in the Alexandrian Library: rhetoric, law, epic, tragedy, comedy, lyric poetry, history, medicine, mathematics, natural science and miscellaneous (see http://www.greece.org/alexandria/library/library11.htm; also http://www.greece.org/alexandria/library/library13.htm). See Rudolf Blum, Kallimachos: The Alexandrian Library and the Origins of Bibliography (German original 1977; English translation by Hans H. Wellisch; University of Wisconsin Press, 1991). 48 Of course we cannot assume that everyone with literary connections who lived in Alexandria actually made use of that fabled library or was somehow influenced by its presence. Still, the intellectual climate of Alexandria probably contributed to raised consciousness about books, and perhaps also increased availability of books. 49 Josephus grew up in association with the Jerusalem temple, and claims that it contained written records; see Ant 3. [1.7].38 -- the Ex 17.6 account is found in a writing (graphe) stored in the temple (ἐν τῷ ἱερῷ ἀνακειμένη γραφὴ); 5. [1.17].61 -- the account of Joshua's lengthened day (Josh 10.13) is found in the writings (grammata) stored in the temple (διὰ τῶν ἀνακειμένων ἐν τῷ ἱερῷ γραμμάτων). Relating to earlier times, there are references to books stored in the temple (e.g. "the book of the law" under Josaiah, 2 Kings 22.8-13 -- which Josephus reports as "the holy books of Moses" in Ant 10. [4.2].58 ταῖς ἱεραῖς βίβλοις ταῖς Μωυσέος ἐν τῷ ναῷ κειμέναις; see also 62 τὰς ἱερὰς βίβλους ; in 4. [8.44].303 the "poetic song in hexameter" of Moses was left "in a book in the temple" ἐν βίβλῳ ἐν τῷ ἱερῷ), or at least in the Jerusalem area (by Nehemiah and later, by Judas Maccabee; 2 Macc 2.13-15), and to the destruction of such books (see 4 Ezra 4.23 and 14.21). But we lack detailed information as to whether the Jerusalem temple ever housed a more extensive or formal library, or who might have had access to such. Like Alexandria, the atmosphere in Jerusalem probably encouraged knowledge of respected and/or available literature, at least while the temple was standing..
50 For a recent overview, see Martin C. Albl, And Scripture Cannot be Broken: The Form and Function of the Early Christian Testimonia Collections (Brill, 1999). Various types of excerpting are attested in early Jewish and early Christian contexts: e.g. 4QTestimonia and Florilegium, Melito (above, n. 42), Cyprian's Ad Quirinum (ed. W. Hartel, CSEL, 1868-71), Ps-Epiphanius' Testimony Book (ed. Robert V. Hotchkiss, SBL Texts & Translations, 1974), Eusebius' Preparation of the Gospel (ed. and tr. E. H. Gifford, 1903; online at http://www.tertullian.org/fathers/eusebius_pe_00_eintro.htm) In the "pagan" world, excerpting was also practiced -- see e.g. the "logoi sofon" discussions by James Robinson [SBL President 1981] and Helmut Koester [SBL President 1991], Trajectories Through Early Charistianity (Fortress, 1971). The "tyranny of canonical assumptions" is the temptation to impose on those ancients whom we study our modern ideas about what constituted "scripture" and how it was viewed. [[image #49 (that sentence)]] Illustrations from contemporary literature are not difficult to find, even from those who know better. Philologically, at the micro level, how often have you seen "the Septuagint" treated as a homogenous unit from which one can draw examples as though they all came from the same translator at the same time? [[image #50 (oversimplification)]] Or even "the NT," for that matter, as though it were a single authored lump. 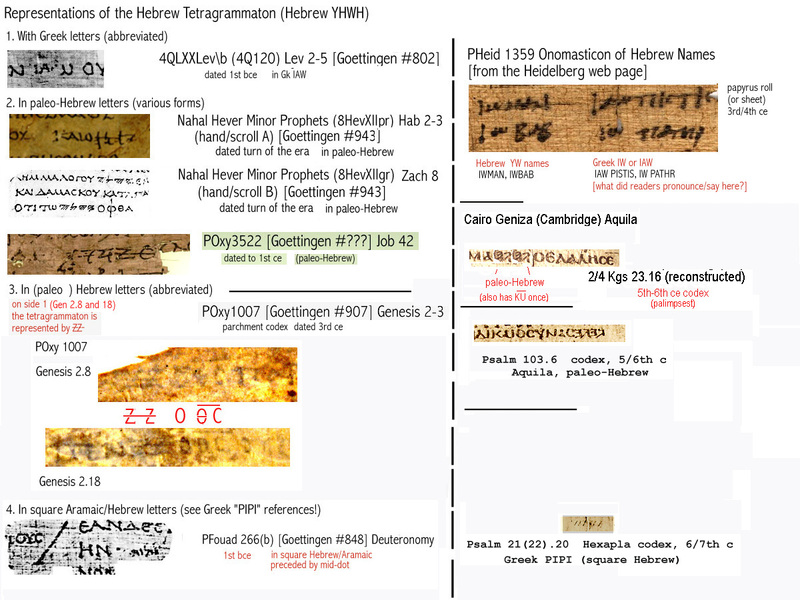 And, of course, there is "the Hebrew (or Masoretic) text," referring to the heterogeneous collection itself 51 -- what have we learned when we find a term or expression that occurs a certain number of times in one of these? Historically responsible philological work, of course, does not pay attention to these boundaries, either as limits (why not also look at appropriate extra-canonical materials?) or as touchstones (why should the Greek -- or Hebrew -- of Isaiah be uncritically lumped together with the Greek -- or Hebrew -- of Psalms?). 51 Some examples: E.g. VetTest 41 (1991) 204, using "the LXX" as a shorthand for the Greek of the particular passage under discussion (similarly "the MT" later in the article); E.g. JBL 125 (2006) 441 "Biblical Hebrew" as a linguistic entity in which nuances can be sought (presumably he means the sorts of Hebrew usages attested by the biblical anthology). 52 See, e.g., the classic collection by A. Resch, Agrapha. Aussercanonische Schriftfragmente. Gesammelt und untersucht und in zweiter völlig neu bearbeiteter durch alttestamentliche Agrapha vermehrter Auflage hrsg. von Alfred Resch. Mit fünf Registern. (Extra-canonical scripture fragments, collected and studied, and presented in a second fully reworked edition expanded with reference to OT Agrapha, with five indices; Texte und Untersuchungen zur Geschichte der altchristlichen Literatur 30.3-4, Neue Folge 15.3-4) Leipzig, 1906 [first ed 1889]. 53 E.g. Num 21.14 (the book of the Wars of the LORD), Joshua 10.13 and 2 Sam 1.18 (the book of Jashar), 1 Kings 11.41 (the book of the Acts of Solomon), 1 Kings 14.19 et passim (the book of the Acts of the Kings of Israel, or of Judah); Luke 1.1-4; etc. 2. The problem of textual myopia (the paratextual worlds).-- Our most direct gateway to the thoughts and perceptions of the ancient world is through the preserved texts.54 I have no argument with that observation. But too often we forget, or fail to pay attention to, the various contexts in which those texts were produced. Most of them have past histories, whether in terms of sources collected and compiled, or in relation to one or more earlier editions ("evolved literature"55). Seldom do we have access to an "original" directly from its author or compiler. [[image #54 (some modern critical eds)]] We see the texts in some sort of static form, usually as cleaned up and edited by a modern scholar or scholarly group. For the most part, we have little choice. Each of us cannot be expected to do everything involved in deciphering manuscripts and generating text editions.56 That is one fascinating aspect of paratextuality that I can only note in passing here. 54 This section focuses on "text" in its narrower sense referring to written material. For modern theoretical discussions of what constitutes "text," see Elizabeth A. Clark, History, Theory, Text: Historians and the Linguistic Turn (Harvard University Press, 2004), chapter 7, and below n. 58. 56 Understanding the processes involved in creating textual editions is an important component of scholarly awareness. For a useful bibliographical introduction to these materials, see http://www.the-orb.net/wemsk/textcritwemsk.html, compiled by James Marchand (WEMSK = "What Every Medievalist Should Know"). 57 It is not clear when and under what circumstances the Greek translations of 1-2 Chronicles came to be called "Paral(e)ipomena" -- the earliest evidence of which I am aware is Melito (and Origen) according to Eusebius (above, n. 30). Nor is it clear that this was already a title in use in the Greek speaking world at large. In Jewish and Christian circles, the title also appears for most MSS of "Paraleipomena Jeremiou," and in two references in Testament of Job (40.14, 41.6). Based on content, such works as LAB or even Deuteronomy could easily be labeled "Remainders" (depending, of course, on what is assumed to be the basis of comparison). But those are still inscribed texts, even if later judged inferior, or if lost along the way. My concept of the paratextual extends also to non-textual transmission of traditional materials, whether originally derived from texts, or originating and surviving from the outset without reference to texts. [[image #58 (oral tradition)]] We often hear talk about "oral traditions," and the minstrels who would have transmitted them, even while we depend upon surviving written texts to unlock such secrets (e.g. Homer, Psalms).58 But, of course, that is but the tip of a very large iceberg. Even today, with other sorts of minstrels at work, much of what we think we know comes to us in non-textual, less formalized ways, through hearing of various sorts. Grandmothers are crucial, along with teachers and newspeople, and the like. Often that material comes to the transmitters directly from texts, but also often not. 58 See e.g. the survey article by Robert C. Culley, "Oral Tradition and Biblical Studies," Oral Tradition 1 (1986) 30-65 (available online; Culley's 1963 dissertation on Oral Formulaic Language in the Biblical Psalms was published in 1967 as Near and Middle East Series 4 [Univeristy of Toronto Press]), and the 1989 SBL Presidential Address by Paul J. Achtemeier, "Omne verbum sonat: The New Testament and the Oral Environment of Late Western Antiquity" (JBL 109 , 3-27). On orality in rabbinic Jewish tradition, see Martin S. Jaffee, Torah in the Mouth: Writing and Oral Tradition in Palestinian Judaism 200 BCE-400 CE (Oxford University Press, 2003), and Elizabeth Shanks Alexander, Transmitting Mishnah: The Shaping Influence of Oral Tradition (Cambridge University Press, 2006). More generally, pioneers in the modern study of oral tradition include especially Milman Parry and his student Albert Bates Lord: see The Making of Homeric Verse: The Collected Papers of Milman Parry, edited by Adam Parry (Oxford: Clarendon Press. 1971; reprinted New York: Arno Press, 1980), and Lord, Singer of Tales (Harvard Studies in Comparative Literature; Harvard University Press, 1960; supplemented edition 2000). See also Walter J. Ong, Orality and Literacy: The Technologizing of the Word (New Accents series; London and New York: Methuen, 1972); John Miles Foley, The Theory of Oral Composition: History and Methodology (Indiana University Press, 1988); Rosalind Thomas, Oral Tradition and Written Record in Classical Athens (Cambridge Studies in Oral and Literate Culture 18; Cambridge University Press, 1989 [1992,2003]) and Literacy and Orality in Ancient Greece (Key Themes in Ancient History; Cambridge University Press, 1992). The Center for Studies in Oral Tradition at the University of Missouri-Columbia was founded by Foley and publishes the Journal Oral Tradition (1986-), now free online (http://journal.oraltradition.org) as well as an extensive annotated bibliography (http://oraltradition.org/bibliography/). 59 See Alan K. Bowman and Greg Woolf (eds), Literacy and Power in the Ancient World (Cambridge University Press, 1994); William V. Harris, Ancient Literacy (Harvard University Press, 1989 ), and more generally H-I. Marrou, A History of Education in Antiquity (tr. G. Lamb; New York: Sheed and Ward, 1956). Also R. Thomas, Literacy and Orality (above, n. 58). According to Meir Bar-Ilan, "Illiteracy in the Land of Israel in the First Centuries C.E." (pp. 46-61 in S. Fishbane, S. Schoenfeld and A. Goldschlaeger (eds. ), Essays in the Social Scientific Study of Judaism and Jewish Society 2 (KTAV, 1992), "under Roman rule the Jewish literacy rate improved in the Land of Israel. However, rabbinic sources support evidence that the literacy rate was less than 3%" (end; online at http://faculty.biu.ac.il/~barilm/illitera.html). 60 For discussions about possible dictation, see Skeat, "The Use of Dictation in Ancient Book Production," Proceedings of the British Academy 42 (1956) 179-208 (reprinted in Elliott, Writings [above, n. 20], 3-32). 61 For recent discussions of "canon" in the light of the DSS see James C. VanderKam, From Revelation to Canon: Studies in the Hebrew Bible and Second Temple Literature (Brill, 2002); Eugene Ulrich, "The non-attestation of a tripartite canon in 4QMMT," CBQ 65 (2003) 202-214 (among other titles); and the collection The Canon Debate (ed. Lee Martin McDonald and James A. Sanders; Hendrickson Publishers, 2002) passim. On the question of alternate versions, the existence of the shorter form of Jeremiah in Hebrew (as in the Old Greek) is striking, as are the various collections of psalms and hymns, and the wide variety of previously known as well as unknown parascriptural texts. 62 Here I have in mind the wide range of possibilities that stand between the creation of textual material and the production of what has survived for us. Generally speaking, the "pre-canonical" texts went through the same sort of development that is so often claimed for the "parascriptural." [[image #63 (Gospel of Judas)]] I'm not about to tell you that the newly discovered Gospel of Judas is historically accurate or that the sayings attributed to Jesus in the Coptic Gospel of Thomas reflect his very words or thoughts63 or that David and Solomon produced all the psalms and spells attributed to them.64 [[image #64 (David's Psalms)]] These materials came through various filters present in their paratextual worlds and need to be understood in those contexts. But exactly the same things are true of the canonical psalms and the fourth canonical gospel, and yes, even of the much studied synoptic gospels. All these texts have histories, go through modifications, and reflects viewpoints, Mark no less than Thomas, Deuteronomy no less than the Temple Scroll. And if, indeed, the earliest followers of Jesus through whom such traditions were transmitted, or created, were Semitic language speakers, an additional level of paratextual considerations is introduced to further complicate an already highly complex picture. [[image #65 (Some Titles)]] The surviving texts may be our main gateway to the pasts they are thought to report, but the actual pasts are much fuller than the texts on which we initially depend. And all texts, canonical or not, have value for our attempts to reconstruct the processes that brought us the information we claim to have. 63 E.g. Bart D. Ehrman, The Lost Gospel of Judas Iscariot: A New Look at Betrayer and Betrayed (Oxford Univeristy Press, 2006); Rudolphe Kasser, Marvin Meyer, and Gregor Wurst (with additional commentary by Ehrman), The Gospel of Judas (National Geographic Society, 2006); Herbert Krosney, The Lost Gospel: the Quest for the Gospel of Judas Iscariot (National Geographic Society, 2006); Robert McQueen Grant [SBL President, 1959] in collaboration with David Noel Freedman [SBL President, 1976], The Secret Sayings of Jesus, with an English translation of the Gospel of Thomas by William R. Schoedel (Doubleday, 1960); Marvin Meyer, Gospel of Thomas: the Hidden Sayings of Jesus, with an interpretation by Harold Bloom (Harper San Francisco, 1992). 64 The claim in 11QPsalmsa 27.4-11 is striking: David wrote 3,600 psalms, 364 daily liturgical songs, 52 sabbath liturgical songs, 30 festal liturgical songs, and 4 exorcistic songs -- for a total of 4,050 -- all through the spirit of prophecy. [[image #66 ("text" & texts )]] For this purpose, I've been using "text" mainly in its restrictive sense, to refer to complete writings that we usually identify with a producer (author/compiler) and to which we ascribe titles (see n. 54 above). Published written products that have survived, as it were. But the paratextual world is much broader than those items in their various forms, embracing also the materials studied through art and archaeology, liturgy and song, communication at every level including language and idiom in its various developments. Failure to pay attention to that big picture impoverishes our research proportunately. Which leads to my final warning. 65 On various aspects of ancient life, see Michael Grant and Rachel Kitzinger, eds. Civilization of the ancient Mediterranean: Greece and Rome (3 vols. ; Charles Scribner's Sons, 1988); Jack M. Sasson, ed., Civilizations of the Ancient Near East (4 vols. ; Charles Scribner's Sons, 1995); and at a less detailed level, Charles Freeman, Egypt Greece and Rome: Civilizations of the Ancient Mediterranean (Oxford University Press, 1999). 66 For recent discussions of "the exodus" see Carol A. Redmount, "Bitter Lives: Israel in and out of Egypt," chap. 2 in Michael D. Coogan, ed. Oxford History of the Biblical World (Oxford University Press, 1998); E.S. Frerichs and L.H. Lesko, eds., Exodus: The Egyptian Evidence (Eisenbrauns, 1997); James K. Hoffmeier, Israel in Egypt: the Evidence for the Authenticity of the Exodus Tradition (Oxford University Press, 1997). 67 On ancient technology, see Robert James Forbes, Studies in Ancient Technology (9 vols; Brill, 1955ff [2nd ed 1964ff; reissued 1997ff]); also selections in the two Scribner's series listed above in n. 65. [[image #72 (reading Psalms)]] I don't suppose that most of these questions need to be settled before one can read the Psalms with appreciation or commiserate with Paul over the problems he encountered or imagined at Corinth. On the other hand, understanding some of the language found in the Psalms, or in somewhat different (more practical?) contexts in Proverbs or Sirach, is assisted by one's understanding of the life settings of the authors or compilers. And knowing what life was like in Corinth, or what Paul assumed to be correct conduct, will certainly help in reading those letters intelligently. 69 Movies, of course, are often based on novels. For a "starter" list, see the "Internet Movie Database," keyword "bible" (then "based-on-the-bible" -- http://www.imdb.com/keyword/based-on-the-bible/), including such classics as The Ten Commandments, Greatest Story Ever Told, The Last Temptation of Christ, as well as others less well known. 70 Groups called variously "Carpocratians" (Clement of Alexandria, Stromateis 2.2) and "Phibionites" (Epiphanius, Panarion 26 and elsewhere), among other names, receive ridicule from mainstream opponents and critics, but represent significant aspects of late antique history and deserve to be understood in their historical and cultural contexts, however one may feel about their specific ideas and practices. See Stephen Benko, "The Libertine Gnostic Sect of the Phibionites according to Epiphanius," Vigiliae Christianae 21 (1967) 103-119 for a collection of the confused and confusing evidence. 71 On ancient "magic," see Hans Dieter Betz [SBL President 1997], The Greek Magical Papyri in Translation, Including the Demotic Spells (Chicago University Press, 1986, 19922) . Regarding "sacred prostitution," Karel van der Toorn surveys the texts and theories while concluding that it did not exist as a cultic practice in ancient Israel ("Female Prostitution in Payment of Vows in Ancient Israel," JBL 108 (1989) 193-205); for a useful discussion with bibliography see also Johanna H. Stuckey, "Sacred Prostitutes," online at http://www.matrifocus.com/SAM05/spotlight.htm. [[image #77 (razor)]] In trying to be clever, I've invoked "Ockham's razor" as a commonly used symbol of the desire for simplification. This is doubtless unfair to William of Ockham and others before and after him who shared the same outlook, especially since this oversimplifies and misapplies the principle!72 The argument was that when faced with various explanations of a phenomenon observed in the natural world the simplest, and presumably the most natural, should be chosen. If weights invariably fall when dropped, there is no need to appeal to divine intervention in each instance by way of explanation. But the proposers of such a principle weren't intending to develop rules for studying history, and human conduct is in general quite unlike the results of "natural law." Invoking the principle of simplicity in historical studies may be comforting, but also is likely to leave many issues unaddressed. [[image #78 (Synoptic sources)]] Students of the synoptic problem recognize this when they affirm the priority of Mark -- that's pretty simple -- but then also introduce the Mark before our Mark, and the interpenetration of floating "Q materials" (or not!) on the developing traditions.73 Similar things occur in Pentateuchal criticism, where the simplicity of the introductory textbooks dissolves in the spotlight of closer analysis.74 Or the alleged conquest of Canaan, or the success of Christianity under Constantine, or myriads of similar matters. Sometimes there are simple answers to such historical and textual issues, but my impression is that usually there are not. Of course, when we teach, we often need to simplify. But we do not need to hide from our students the fact that in doing so, we ignore or compress the "big picture" for the sake of pedagogy. which reproduces the article on "The Myth of Ockham's Razor" by William Thorburn, published in Mind 27 (1918), 345-353; on Ockham more widely, see the two volume study by Marilyn Adams, William Ockham (Notre Dame Press, 1987). 73 See Allan Barr (with a new introduction by James Barr), Diagram of Synoptic Relationships (T&T Clark, 19952). For a recent foray on this front -- even invoking "Ockham's razor" to help establish "Matthean posteriority" as the answer to the "Q" hypothesis (p.140) -- see Evan Powell, The Myth of the Lost Gospel (Las Vegas: Symposium, 2006), entertainingly reviewed by Jim West in Review of Biblical Literature [http://www.bookreviews.org] (2007). The same release of RBL has a review of Richard Valantasis, The New Q: A Fresh Translation with Commentary (T&T Clark, 2005) by Joseph Verheyden, which simply builds on the assumed existence of Q. 74 On pentateuchal issues, see Ernest W. Nicholson, The Pentateuch in the Twentieth Century: The Legacy of Julius Wellhausen (Oxford University Press, 1998). [[image #79 (magic?)]] The worlds we study are full of their own brands of "magic," by which I mean those things that kept them ticking, or were intended to do so, even in times of extreme stress (see n. 71 above). From our perspectives, much of this was or borders on the irrational, even among our most rational ancestors in Greece and Rome.75 Divine forces and their opposites were pervasive for most people, reflected in the stories told, the prayers and preparations made, the processions held, the monuments erected, even the coinage issued.76 Our use of rabbits' feet or dashboard saints pales by comparison, although similarities are also apparent. [[image #80 (household gods?)]] Care for the representations of the household gods was important in the world in which Jacob and the patriarchs of Israel are represented,77 and meat butchered in the context of the Greco-Roman temples was part of normal life for many of our first century subjects of study.78 To challenge and ultimately to transform social attitudes to such phenomena was not an easy matter, and frequently amounted to compromise rather than abandonment. Gods may become angels, or abstractions, but the functions remain similar. [[image #81 (Winged Victoria)]] The "Christian" emperors of the late 4th and early 5th centuries still issued coins on which the (former?) goddess Victoria/Victory appears in various functions, winged and often by name, although most other Greco-Roman deities have disappeared.79 Change is not a simple matter, then as now. 75 Eric R. Dodds, The Greeks and the Irrational (University of California Press, 1951 [reprinted often]); table of contents online at http://ark.cdlib.org/ark:/13030/ft0x0n99vw/. 76 See Keith Hopkins' novel, A World Full of Gods (above n. 68). For an impassioned (and perhaps exaggerated) description of a situation in the late 2nd century CE, see Lucian's exposé of Alexander of Abonutichus. 77 On household gods, see Moshe Greenberg, "Another Look at Rachel's Theft of the Teraphim," JBL 81 (1964) 239-248. 78 On temple sacrificed meats, see Bruce Winter, After Paul Left Corinth: the Influence of Secular Ethics and Social Change (Eerdmans, 2001), reviewed by Debra Bucher in Bryn Mawr Classical Review 2002.06.15. 79 On coins see, e.g. A. R. Bellinger and M. A. Berlincourt, Victory as a Coin Type (Numismatic notes and monographs 149; New York: American Numismatic Society 1962). [[image #82 (in conclusion)]] Keeping up with it all is a gigantic challenge, pretty much impossible for any one individual. So we have our colleagues and our groupings, our mega-societies with their various subsets and interactions. And now, of course, we and our students have google.com and its compeditors, bringing home the point that we live in a world where access to information has exploded exponentially -- "the information age." For ourselves as well as our students, a major question is "what or whom can I trust?" What constitutes suitable authority on any given subject and how do I identify such? Of course, it is obvious that you can trust anyone chosen to be president of a prestigious academic society, especially if they have a Germanic name,80 but can you trust them for everything? And if not (or even if so), who else? and for what? 80 Please note that the SBL President elect for 2007 is Professor Katharine Sakenfeld -- a good German name! [[image #83 (method)]] Since even the "experts" seldom agree on details, it is important to determine, as nearly as possible, the extent to which expert conclusions depend on often unexpressed, perhaps even unconsciously held assumptions. It is not only with respect to our ancient source materials and their contexts that awareness of those ancient perspectives is crucial, but also with respect to the modern scholarship on which we necessarily depend.81 But this exercise in paramethodology works both ways. Someone's commitment to a particular modern theological or philosophical stance may call into question conclusions about ancient materials deemed important for defending that stance, but recognition of that type of problem should not result in throwing out the baby with the bathwater. [[image #84 (Wellhausen, Harnack)]] While I may find that a Wellhausen filtered his synthetic reconstructions through a Hegelian view of history, that does not mean that all of his work is problematic.82 Nor does Harnack's unsympathetic attitude to modern Judaism negate the value of his prodigious knowledge of early Christian history.83 We need to be able to discern when and in what connections scholarly conclusions are self-validating, and when they need to be taken with a grain of salt. Their, and our, first hand acquaintance with the relevant evidence seems to me to be the beginning of such knowledge, and the main locus for trust. 81 For a recent discussion see Elizabeth A. Clark, History, Theory, Text: Historians and the Linguistic Turn (Harvard University Press, 2004). (above, n. 54). 82 A bibliography of 235 publications by Wellhausen (1844-1918) was prepared by Rahlfs for the Festschrift edited by Karl Marti, Studien zur semitischen Philologie und Religionsgeschichte Julius Wellhausen zum siebzigsten Geburtstag ... (ZAW Beiheft 27; Giessen: Topelmann, 1914). On Wellhausen's treatment of Judaism, see Jon Levenson, The Hebrew Bible, the Old Testament, and Historical Criticism: Jews and Christians in Biblical Studies (Westminster John Knox Press, 1993). 83 Some of Adolf von Harnack's most solid synthetic historical work on early Christianity can be viewed in Die Mission und Ausbreitung des Christentums in den ersten drei Jahrhunderten (Hinrichs, 1902, revised 1906, 1915, and finally 1924; the first and second editions were translated into English by James Moffatt, The Mission and Expansion of Christianity in the First Three Centuries [London: Williams and Norgate / New York: G.P. Putnam's Sons, 1906, 1908]), and this material is now avaialble online at http://ccat.sas.upenn.edu/rs/rak/courses/535/Harnack/bk0-TOC.htm. [[image #85 (para para para)]] Of course, we will doubtless tire of "para para para" terminology -- if you haven't already! -- but perhaps it can serve us well in a period of transition to more satisfying and enduring terminology. After all, our evolving perceptions of the "parabiblical" (or as I now prefer, "parascriptural") are really less a subcategorization than an awareness of that large body of material (both text and tradition, as well as artwork and stones and buildings) that was respected and taken seriously by the people and cultures we study. [[image #86 (SBL "ical")]] Descriptively speaking, we are, and have been from the outset, a Society of Literatures and Traditions and Realia pertaining to the ancient worlds from which Judaism and Christianity emerged and developed through late antiquity; not simply "Bible studies," but "biblical" studies. Whatever else it may be, when done carefully and responsibly that is basically a "paramanic" endeavor!